Go Eun Chan works many jobs to pay off debts and support her widowed mother and sister, to the extent of giving up her feminine side. And this is where to story beings, or rather how to story begins when she encounters the heir to an established food company, Choi Han Kyul. The two characters encounter each other when Han Kyul's grandmother sets him up with many dates, hoping that he would settle down soon. Due to an attempted robbery encounter, Han Kyul mistook Eun Chan for a boy. In a subsequent meeting, in a bid to get rid of his arranged dates Han Kyul 'hires' Eun Chan to act as his gay lover. Desperately in need of money, Eun Chan has no other choice but to accept his proposition. Their interaction does not end there as not long after their stunt Han Kyul's grandmother puts him in charge of a coffee shop on the brink of bankruptcy, agreeing to stop arranging the blind dates provided he manages to turn the business around. Thus, he engages the services of Eun Chan to assist him on his assignment; rather it was more like Eun Chan volunteered (begged) herself to work for him (she figured it would be better holding a stable job). And so their adventure together begins as they battle a grumpy and filthy previous owner, try to turn the business around, meet interesting characters along the way, throw in a couple of old flames - almost resulting in a love rectangle, and managing to fall in love with each other. 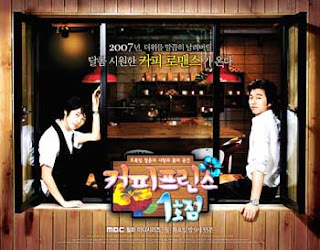 This where the fun of the story lies when Han Kyul finds himself falling for a fellow “male”, causing him to have a question his orientation and wonder if he should accept or ignore his "homosexuality". Although the story starts out pretty slow at the beginning, it slowly picks up pace towards the end, with a light fluffy feeling.